The city will increase property tax assessments on land in neighborhoods near the water to meet a legal requirement for fair assessments based on market values. 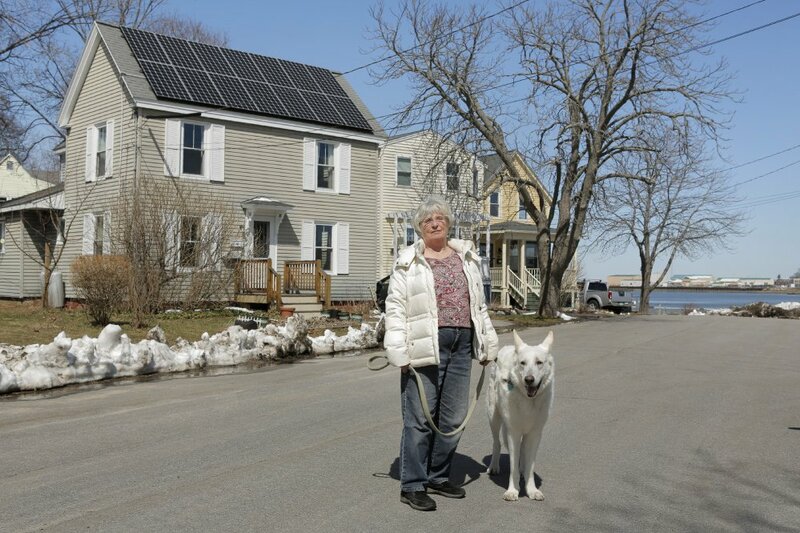 City Councilor Susan Henderson stands with her dog Jake outside her home on E Street in South Portland. SOUTH PORTLAND — From Spring Point to Ocean Street, home sales in the city’s eastern neighborhoods have rebounded dramatically from the downturn that followed the 2008 recession. Properties anywhere near Willard Square and the waterfront are selling for 25 percent to 45 percent more than the city’s assessed values, which haven’t changed since all property assessments were lowered in 2009 and 2010. City Assessor Jim Thomas plans to increase assessed values – on land only – by 10 percent to 15 percent in the affected neighborhoods this spring, which means many residents will see increases in their property tax bills starting this summer. Thomas and other city officials are concerned that failing to close the gap between assessed and market values will jeopardize funding from the state, which enforces the constitutional requirement for equitable distribution of the municipal tax burden based on market value. But some people worry that the continued rise of home prices and tax assessments signals the further gentrification of South Portland’s eastern neighborhoods. Homes assessed at $230,000 are selling for $300,000 and others on or near the water are selling for close to $1 million. City Councilor Sue Henderson lives on E Street in the city’s up-and-coming Knightville neighborhood, three houses from the rocky edge of Portland Harbor. Now in her 70s, Henderson and her late husband, Scott Hatch, raised four children in a modest 1890 New Englander that’s assessed at $182,000. It would likely sell for much more, but until recently, she said, people looked down on Knightville as a drive-through neighborhood. Assessed property values across the city are currently at 92 percent of market value, Thomas said. Maine Revenue Services, the state’s tax agency, expects assessed property values to be as close to 100 percent of market value as possible. If the city doesn’t address the assessment gap in the eastern neighborhoods, and the overall sales-to-assessments ratio falls below 90 percent, Thomas said the city will see reductions in state reimbursements and revenue sharing, including education funding. Rather than a costly citywide revaluation, when a firm is hired to visit and assess every property, Thomas said he plans to make slight adjustments in land assessments in the affected neighborhoods over the next few years. The last citywide revaluation was done in 2006, followed by a 10 percent reduction in all assessments in 2009 and an additional 5 percent reduction in land assessments in 2010. Thomas said his office also will begin doing site inspections for all properties at least once every five years. Moreover, because some properties on the east side of the city are assessed as much as 40 percent below market value, that means other homeowners are paying more than their fair share of the property tax burden under the law, said Greg L’Heureux, city finance director. He noted the challenge that Scarborough faced when some residents of seaside neighborhoods recently questioned their higher assessments. When Thomas adjusts Sue Henderson’s property assessment, he’ll likely add $7,280 to $10,920 to the $72,800 assessed value of her 0.06-acre lot. That would add increase her overall assessed value from $182,000 to $189,280 or $192,920. At the current tax rate of $17.70 per thousand of assessed property value, that adjustment would add $129 to $193 to her annual tax bill. Henderson said she appreciates that her home has increased in value, but she fears that the real estate market is turning the east side of the city into a socioeconomic island. She worries that it will become an exclusive community where only upper-income people can afford to live, without the benefits of having daycare providers, artists, restaurant workers, firefighters and grocery clerks as next-door neighbors. Henderson isn’t sure what can be done to stem South Portland’s evolution from a mostly working-class city to a community of haves and have-nots. She wonders if targeted property tax relief, zoning changes or greater incentives to promote affordable housing construction might make a difference. She believes city officials will have to grapple with the problem soon. “We’ll have to do something so people aren’t forced out of their homes and we can maintain diversity in this city,” Henderson said.